I made that reading queue a little while back, if you recall. If you do not, you may find it here. Well, I’m reaching out to my readers, because I honestly haven’t been flying through that list like I thought I would. Despite the fact that I have wanted to read some of the books in my queue for a while, I still am having a hard time motivating myself to read them. There is definitely a part of me that would rather make chex mix, because it is not on a list, than read a book that is on a list. Lists may not be my thing. So far, I have read about 3 or 4 books from that list I made and then published, and about 5-7 books not actually on my list at all, but that have just intrigued me in the meantime. I’m pretty sure that I’m also, on some level, using those other books as a way of procrastinating the reading on my queue. It’s not that I don’t want to read the books on the list anymore, but only that they are in list form, and hence somehow less appealing to me. However, in a roundabout way, the list has inspired me to read. I have been buying more books than I was before, and I have been reading more frequently, which was the whole point of the list. So, at least I have part of it down. Part of me feels embarrassed, but another (larger) part feels excited to be reading anything, and to not have to follow or be tied down to a specific list, to instead read whatever I feel like. To read outside the numbers and lines I set up as guideposts. I still would like to read those other books eventually, but may not get to them in any specific time frame or order. This entry was posted in Bookstores, Fun, reading and tagged baking, Books, Bookstores, Chex Mix, Reading, reading for fun, reading lists, writing. I have similar problem. I’ll check out a book from the library and suddenly I’ll need to read one that has been on my shelf for years instead. Reminds me when I first discovered MP3s. All day long, I’d make songs-to-download lists in my head and end up getting the most random stuff when actually in front of the computer, picking and choosing. I think its a good thing, a mind that doesn’t function to order. Thank you for your comment! I really agree with you, and love your last phrase especially. I’ll keep that in mind and try not to be too hard on myself. I like that you can collect photos and images for inspiration, that still link back to the original source site, so there is minimal chance of copywrite infringement. Ah! Of course! You’re completely right and I haven’t even thought of it that way. I haven’t quite taken the time to look at Pintrest, but I’m hearing more and more of it each day! I’m sure it’s easy to get lost within all the links and travel into cyberspace forever while being bombarded by inspiration. Oh, also, your line “There is definitely a part of me that would rather make chex mix, because it is not on a list, than read a book that is on a list” is perfect. Oh how I am familiar with that feeling… although not quite with making chex mix (only due to not knowing how), but more in the sense of clicking and browsing online. The internet can be quite the double edged sword! Ah yes, thank you for your comment. 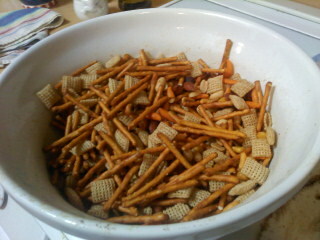 Ironically, I did not know how to make chex mix either, before I wanted to use it as a procrastination tool!